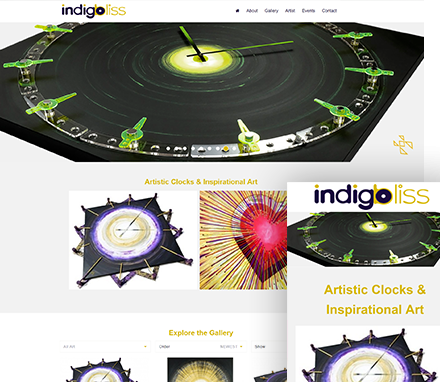 Indigo Bliss is an art studio producing large, bespoke fine art clocks, inspirational/meditation art. Owned by Robert Leach who is a Graphic Designer. His art is a series of dynamic images and intriguing canvasses that have subtle tones and colours, ideal for company boardrooms or business/hotel lobbies. Robert chose our Automotive Design – A one-page site, using our Up & Running Package. This is Roberts second site with us, as we had also designed his website for Generation Pixel. Robert required a new website that offered detailed information about his art and inspiration, products available and contact information. This is the first Air Websites Product Catalogue site and as a Graphic Designer, Robert is obviously appreciative of good design work. The Ascensor team have been very helpful and supportive during the build of my site and we have a great working relationship. I needed page elements that were extra to the Air template I purchased and we worked through what was possible given certain budgets and expections/limitations of web rules. Online shops with modern website designs look so easy with drop and drag but their are so many pitfalls and hard to contact people if things go wrong. With Ascensor I have been able to drop in for meetings and training at anytime. I know I now have a professional and robust site that conforms to web rules and updated on a monthly basis. Thanks to Jonathan and Jeannette.